26 1/4 x 24 in. 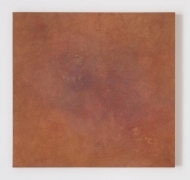 James Cohan is pleased to present Mud Root Ochre Leaf Star, Byron Kim's second solo exhibition with the gallery. 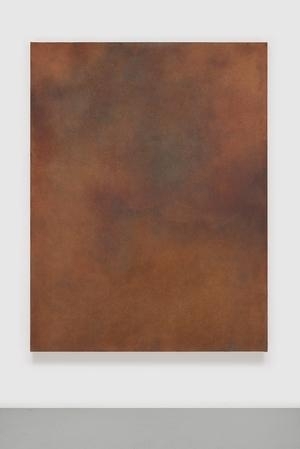 Featuring a selection of stain paintings, the exhibition will open at the gallery's Lower East Side location on Friday, December 9, with a reception from 6-8 PM and will be on view through January 22, 2017. Although Kim was thinking of the subject of a bruise more abstractly, these works have accrued additional meaning over the past year. 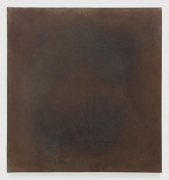 Kim doesn't consider himself a political artist, but he demands that his paintings, no matter how conventional in format, seek a deep relationship with the times in which he works. Kim notes that trauma is in the air, inescapably seeping into our collective consciousness. Although a bruise is the aftermath of trauma, these works are not simply an elegy to a broken body politic; a bruise is also a signifier of healing. The paintings are handmade through a labor-intensive yet cathartic process that privileges meticulous craft and self-discovered techniques over easy reproduction. Kim begins his process by boiling raw canvas or linen. He then dyes the fabric, often multiple times, with sandalwood, ochre, indigo and other natural elements to alter the color of the fibers. 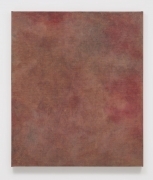 Then he works the surface with natural pigments using rags soaked with hide glue or with oil, eschewing brushes for a more intimate connection with the work. Kim has remarked that a bruise is a “stain below the skin” – a reminder of a past event that requires time to be washed clean. These paintings are an externalization of that reminder, which Kim transforms into art through a purifying devotion to his craft. 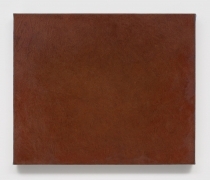 Referencing the whole by representing a single part is a recurrent theme in Kim’s oeuvre. He points both to Robert Smithson’s non-sites and the “big picture” emphasis of Daoist philosophy as the impetus behind this sensibility. 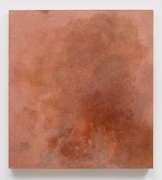 A touchstone of Kim’s practice is the ongoing painting project, Synecdoche, begun during the 1990s and included in the landmark 1993 Whitney Biennial. Synecdoche is comprised of hundreds of monochrome panels that match the skin tone of each subject. These individual panels are arranged in a grid, acting as a large group portrait, reflective of the multicultural zeitgeist of the early 90s. Byron Kim, born in 1961, is a Senior Critic at Yale University. He received a BA in English from Yale University in 1983 and attended Skowhegan School of Painting and Sculpture in 1986. He has received numerous awards including the Alpert Award, UCROSS and Joan Mitchell Foundation Grant. 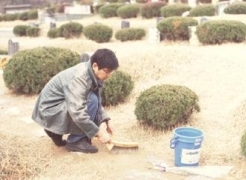 Kim’s mid-career survey, Threshold traveled widely from the Berkeley Art Museum, CA to the Samsung Museum of Modern Art in Seoul and on to five other locations in the United States (2006/7). In 2014 he was included in the exhibition Come As You Are: Art of the 1990s at the Montclair Art Museum which travelled to Telfair Museums, the University of Michigan Museum of Art, and the Blanton Museum of Art at the University of Texas, Austin. In 2015, Kim’s work was presented at the Sharjah Biennial 12 (United Arab Emirates) and in a solo exhibition at the Museum of Contemporary Art San Diego titled Pond Lily Over Mushroom Cloud: Byron Kim Adapts the Black on Black Cosmology of Maria Martinez. 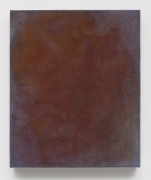 He was included in the exhibition Color Chart: Reinventing Color, 1950 to Today, at the Museum of Modern Art, NY and Tate Liverpool, UK (2008/9). In addition to the National Gallery of Art’s collection, his work is in the permanent collection of the Albright-Knox Art Gallery, Buffalo, NY; the Art Institute of Chicago, IL; the Brooklyn Museum; the Berkeley Art Museum, Berkeley, CA; the Blanton Museum of Art, Austin, TX; the Hirshhorn Museum, Washington D.C.; the M+ Museum, Hong Kong; the Museum of Contemporary Art, La Jolla, CA; the National Gallery of Art, Washington, DC; the Norton Family Collection, Santa Monica, CA; the Pérez Art Museum, Miami; the Wadsworth Athenaeum, Hartford, CT; the Walker Art Center, Minneapolis, MN; the Whitney Museum of American Art, NY; and the Worcester Art Museum, Worcester, MA. Byron Kim lives and works in Brooklyn, NY. Please contact Laura Newman at lnewman@jamescohan.com or 212.714.9500 for further inquiries regarding Byron Kim. Phillips, Carl. “Alba: Innocence,” in Quiver of Arrows: Selected Poems 1986-2006, (New York, Farrar, Straus and Giroux, 2007), 51.